We are very grateful to Grenville Bird for this fascinating recollection of village life. He has promised us more so we hope that they will become a regular feature. My earliest memory is boarding a ‘Wilson’s of Clavering’ light-blue coloured bus in the Anchor yard, Bishops Stortford. to take me over to my grandparents at Henham. Wilson’s bus service to Henham was taken over by the Eastern National in 1937, and I was only two-and-a-half years old at the time. I also remember going to Henham on a dark blue Hicks Bros. of Braintree bus which ran a service from The Falcon in Bishops Stortford until the beginning of the War. Walking up Woodend Green I had to do a detour to avoid the geese which the Gibblins let run on the green. The geese knew I was afraid so they hissed ominously and to this day I don’t like geese. 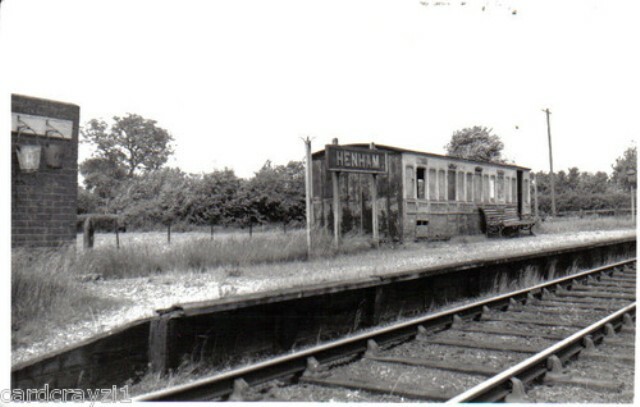 I vividly remember standing on Henham Halt platform, lit by just one oil lamp, waiting for the four o’clock train to take me to Elsenham and hearing the approaching train whistle at Sibleys and then again a bit later at Chickney Road and finally as it approached Henham Halt. The guard lifted me onto the train and I was on my way home. For me it was a sad evening in September 1952 when I boarded the last train at Elsenham and saw the oil lamp at Henham extinguished for the last time. My grandparents, John and Amy Bentley rented a Shepherds Club (a benevolent society) cottage in Church Road but they were actually living at Henleys, next to the village hall. My grandmother had been the housekeeper for Mr. John Morrish, a city gentleman, since he moved to the village in 1919 and when he went blind my grandparents went there to live. After my grandfather died in 1938 my grandmother gave up the tenancy of the cottage and moved her belongings to Henleys so it was there where I spent a lot of my childhood until Mr. Morrish died in 1947. I recall my father taking me through Hollandshead farm, near Henham Lodge, and seeing the old London horse buses which were used as chicken houses. I remember watching people draw up pails of water from the workhouse well opposite Miss Gardiner’s shop, but not being allowed to go too near. The Somerlites van would come and people going out with their cans to buy paraffin. The thing which pleased me most was being taken by my grandmother to buy sweets and there were so many shops in Henham where I could buy them. The biggest shop was Miss Gardiner’s in Church Road. It was the Post Office, and she also sold groceries and provisions, drapery, pots and pans and oil lamps glasses and paraffin. After drawing a gallon of paraffin, Miss Gardiner would just wipe her hands and gladly cut a piece of cheese or slice a few rashers of bacon - no health and safety nonsense! Willet’s shop opposite the old school was a tin shed built on the front of the house, and as well as sweets and groceries, Macky Willet sold fresh fruit and vegetables from his own garden. I can just remember going to buy sweets from a small front-roomed shop in The Row, owned by Miss Witherden just before it closed. Near the old school was Moss’s and on Woodend Green, in a tin shed, attached to the front of the house, was Mussel’s shop. I remember going there and buying marsh mallows and pink and white mice. I have never seen any since. 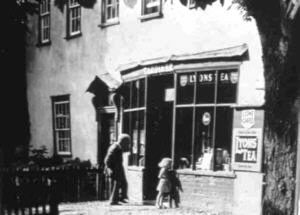 All the boiled sweets sold in the village shops came in large glass jars from Lees of Thaxted. My grandfather was, in his later years, a road sweeper employed by Saffron Walden RDC. In his spare time he also did gardening. He worked in the gardens of the Chamberlain family who lived in Woodend Green and had a large orchard. A lot of the fruit grown in the orchard was sold to the Elsenham Jam factory which had been started up by Sir Walter Gilbey in 1890, also now closed. Mr. Chamberlain, like Mr. Morrish, was a London businessman. My late mother told me that one Sunday afternoon, circa 1921, Mr. Chamberlain took Mr. Morrish to a house in Elsenham to meet Mr. Austen Chamberlain, the half brother of the future Prime Minister Mr. Neville Chamberlain. Whether Mr. Chamberlain from Henham was related to Austen Chamberlain or, by coincidence, they had the same surname, nobody has been able to tell me. My mother was sent into domestic service at Ilford in 1922 and by the time she returned to Henham in 1926 the Chamberlains had moved away. Opposite Henleys is a semi-detached cottage now called Bell Cottage, where my grandfather’s brother and his wife, my grandmother’s sister, Alf and ’Tids’ (Harriet Eliza, known as ‘Tids’ since a child because if her small stature) Neville lived. Two brothers had married two sisters but why they had different surnames was a question little boys weren’t supposed to ask! Alf Neville’s family had been travellers and he was born in the Exhibition Barn. I have tried to find out where the Exhibition Barn was but even Miss Pimblett wasn’t able to help me. He went round working on the steam roundabouts with Thurston’s Fair. He accumulated a large number of sovereigns which he kept in a wooden trunk under the bed. His wife was forbidden to go to the trunk so when he died in 1950 one of the first things she did was to open it. It was empty, and the mystery of what he did with the sovereigns remains unsolved. Electricity didn’t come to Henham until after the war and the whole village was lit by oil lamps and cooking was done on a coal-fired range. I still have happy memories of the cosy atmosphere of the rooms at Henley’s with the cheery glow of the oil lamps on a winter’s night, and the lovely smell of the meat roasting in the oven beside the fire. Somehow it doesn’t smell quite the same when it is cooked by electricity or gas. To recall those childhood memories I still have a “Henley’s night” once a year when on a cold winter’s night I light the paraffin lamp on the table in my hall. My parents were married in Henham Church in April 1933, and I still have the receipt for the hire of the village hall for the wedding reception. The hire cost ten shillings, (50p), It was in the Henham Village Hall where I first heard Rab Butler speak during the election campaign in 1951. He was supported on the platform by his first wife Sydney Courtauld, who gave a speech, before Rab arrived from his previous meeting. Sadly Sydney died at an early age in 1954. Rab Butler was MP for the Saffron Walden constituency from 1929 until he retired from politics in 1965. He held every high office of state, save that of Prime Minister, and it was a great disappointment to many in Henham that the prize was snatched from him in 1957 and again in 1963. I drive over to Henham two or three times a year, park my car and walk through the village to recall some of my happy childhood memories which I shall always cherish. As well as the many shops in the village, Henham was well-served by travelling salesmen. Green’s department store at Stansted delivered grocery each week. Their representative, Chris Brown, brought the grocery then took the list of requirements for the following week’s order. I have already mentioned the Somerlite van which came round with paraffin. The van had open sides on which were displayed pots and pans and other household requirements. By the time I first went to Henham the local bakery had closed, and bread and cakes were delivered by Mr Saunders whose bakery was at Robin Hood Road, Elsenham. Newspapers were delivered from W.H. Smith’s bookstall on Stansted station by an old school friend of my mother, Ellie Camp, who cycled round in all weathers without complaint. But the most colourful deliverer of newspapers was Mr Hickinbottom from Chaureth Green. The villagers called him Moses because his hair was so long, and he came round in a pony and trap, but it was often mid-day before he made his deliveries by which time the news was stale ! Because there was no electricity in Henham, ice cream couldn’t be sold in the village shops, but I do remember in the summer of 1939 a man coming round on a motor bike and sidecar selling it, and I remember sitting on the front lawn at Henleys waiting for him to honk his motor cycle horn letting us know he had arrived, and my grandmother went out with a bowl to collect the ice cream. Coal was delivered to Henleys by Elijah Barltrop whose coal yard was at Sibleys station. A couple of coal trucks were left in the goods yard at Elsenham, then collected by the daily Thaxted branch goods train and hauled to Sibleys from where Elijah delivered his coal. One particular story of a travelling salesman sticks in my mind. My grandfather’s widowed sister-in-law, Edie Bentley, lived with her brother Wally Johnson, in a cottage on Starr Green then known as The Nook but since completely rebuilt and renamed. An unscrupulous man came round Henham taking orders for false teeth. Edie Bentley and Wally Johnson each ordered and paid for a pair. When the teeth arrived by post they were found to be made of cement and unwearable. I can hear Mum’s Aunt Tids Neville now, saying ‘B—-y fools’, which was an expression she always used when someone had done something foolish. After Mr Morrish died in 1947 my grandmother moved from Henham to come to live with her daughter in Stortford, and Henleys was sold to Charlie and Rose Salmon. I didn’t visit Henleys again until a few years ago when I was kindly invited by Mrs Wilson to look over the house which for me holds many happy memories. I was pleased to see that the pump was still standing in the back yard, though no longer in use. As a little boy I used to look forward to going with grandmother to pump the buckets of water. The pump at Henleys was one of the few wells and pumps which didn’t run dry in the great drought of 1921, when water had to be brought to the village by cart, and villagers queued for their buckets of water. My grandfather and his brother, Alf Neville, had ‘green fingers’. They gathered wild rose briars from the hedgerows, propagated them and produced garden roses which they sold to Cant’s Nurseries at Colchester. They were able to produce a bush which bore two different varieties of rose. I well recall seeing one in the garden at Henleys. I also recall seeing in the garden at Henleys, a tree , one side of which grew apples and the other side pears. After my grandmother left I still continued to visit Henham frequently to see my grandmother’s sister, Tids Neville, at the Bell Cottage (then unnamed) opposite Henleys. Before the First World War a lady in Henham was a ‘billeting agent’ for Doctor Barnado’s Home. Several Henham families fostered boys and girls from the Home for which they were paid a few shillings a week. Aunt Tids always fostered girls and several were billeted with her over the years. But two girls, Ada Brain and Mary Gornell, after going back to the Home at Barkingside for training, returned to Henham to live with their foster mother. Mary married and went to live at Birchanger but visited her mother each week; Ada remained a spinster and looked after her mother until she died in 1964. It would be hard to find a person more loyal than Ada; she had a heart of gold. During my visits to Aunt Tids I heard lots of stories about early-20th century-life in Henham. It would appear that elections were more exciting than they are today in the age of television politics. The electors of Henham had to go to the polling station in Stansted to cast their vote. At the election in January 1910, one of the Liberal farmers took his men in a big farm wagon decorated with yellow ribbons for the occasion; on the way back the wagon stopped at the Crown in Elsenham, and the farmer took his men inside to treat them to a drink. Alf Neville and some of his burly fairground mates who were not of the same political persuasion, waylaid the wagon, unharnessed the horses and overturned it. Saffron Walden was about to provide one of the surprise results of the election. It had been a Liberal stronghold and was the seat of their Chief Whip John Pease. He was defeated by 272 votes.